This is the thing I hate about baseball. To recap, Scott Boras and Alex Rodriguez orchestrated one of the most ill-conceived attempts to break the bank in the history of team sports. A-Rod opts out of baseball's richest contract with baseball's most storied franchise, leaving $72M on the table and leaving the Yankees $21M lighter in the wallet (a subsidy from the Texas Rangers that required A-Rod to actually be a Yankee for them to collect it). Adding dishonesty to arrogance, he cites the uncertainty of the futures of Jorge Posada, Mariano Rivera, and Andy Pettitte as the reasons he is opting out, thus completely ignoring the real reason (cue "cash register ringing" wav file). A-Rod then sends Boras, who may or may not be Satan (we're still working on this one), out into the baseball wilderness with a bunch of graphs, charts and Powerpoint presentations to pitch to his potential audience (at the time believed to include the Mets, Cubs, Dodgers, and Angels) why The Chosen One is worth $350M over the next 10 years. Only one problem -- the potential audience actually consisted of one team. The team he left at the altar a couple of weeks ago -- the jilted Yankees. The fact of the matter is that I don't think anyone (other than the team who wound up with A-Rod) was going to offer A-Rod anywhere close to the $27.5M he wound up signing for. A-Rod and Boras grossly miscalculated his worth. There is no doubt that Alex Rodriguez is the best regular season player in baseball. But is it really worth paying him $30M when that can fetch you a decent third basemen and two good arms? 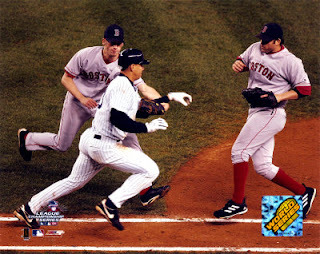 Especially when A-Rod seems to do his best work in the middle of August against the Royals and the Devil Rays? When the score is 9-2? Boras really thought that other baseball teams wouldn't see this? It's one thing to have a "devil may care" attitude when you're signing Ted Lilly to a $10M/yr deal; it's another thing entirely when you have to scratch out $350M to one player AND that player has a history of postseason failure AND that player is seen by many as a phony and a prima donna. There's really only one team with the combination of money, stupidity, and history with A-Rod to pull this off -- and they got him. "... and if an agent gets out of line or makes bad decisions, then that's going to hurt the player. And obviously, that's one of the things that happened here." "There are a few cynics who say, 'Well, he really couldn't get this there.' Trust me, he would have gotten probably more. He is making a sacrifice to be a Yankee, there's no question. ... He showed what was really in his heart and what he really wanted." So let me get this straight, Hank. You think A-Rod was given bad advice by Scott Boras. This bad advice consisted of Boras telling A-Rod to opt out of the last three years of his contract because he felt A-Rod could make more than he was going to make in those three years under his then-current deal ($24M/yr, by the way). Yet according to you, Hank, there were many other teams out there who would've paid more than the $27.5M which A-Rod eventually got from you. (Let's not even get into how he eventually wound up making more money from the Yankees themselves.) So how exactly was this bad advice, Hank? I mean, A-Rod and Boras didn't get the $35M/yr they wanted, but thanks to you, Hank, A-Rod did get a sizable raise and assurance that he'd get paid into his 40's, not to mention a bunch of bonuses tied to revenue increases centered around his chase of the all-time home run record held by "he who shall not be named". Yeah, this is the thing I hate about baseball. The winner in all of this is the NY Post. They guaranteed to sell millions of papers with Pay-Rod, Stray-Rod, and F-Rod covers for the next 10 years.